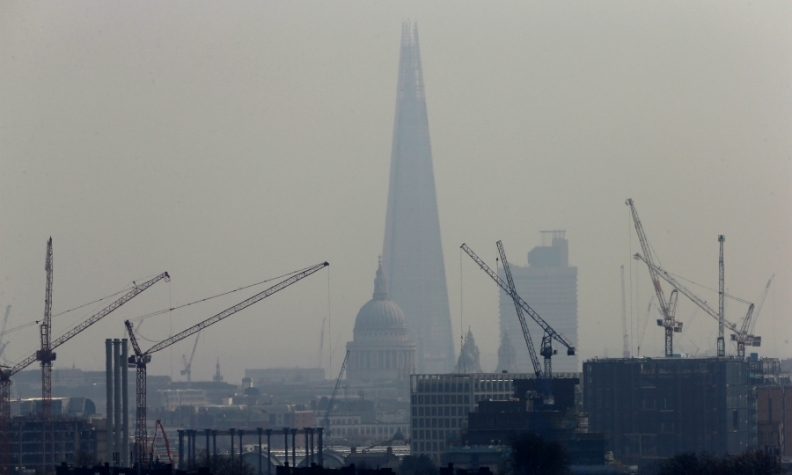 London's air quality is among the worst in Europe. LONDON -- London introduced a charge on the oldest and most polluting vehicles on Monday to try to improve air quality in the British capital, the city's mayor, Sadiq Khan, said. Called the T-charge, the 10 pound daily tax applies to diesel and gasoline vehicles typically registered before 2006 which do not meet the so-called "Euro 4" 2005 European directive to regulate vehicle emissions. The new charge will applied during the same 7 am to 6 pm weekday hours as the existing 11.5-pound congestion tax and could mean some owners paying a combined 21.50 pounds a day to drive in central London. "As mayor I am determined to take urgent action to help clean up London's lethal air. The shameful scale of the public health crisis London faces, with thousands of premature deaths caused by air pollution, must be addressed," Khan said in a statement. "Today marks a major milestone in this journey with the introduction of the T-Charge to encourage motorists to ditch polluting, harmful vehicles." The measures comes after Britain's High Court ruled that UK government measures to combat air pollution were failing to comply with European Union rules on nitrogen dioxide limits. The new measure is part of an 875 million pound effort by the mayor's office to address air pollution in London, with the introduction of an Ultra Low Emission Zone (ULEZ) slated for 2019. Nearly 9,500 Londoners die prematurely every year as a result of long-term exposure to air pollution, according to a 2015 study by researchers at King's College London. Britain's Conservative government said this year that sales of new diesel and gasoline cars would be banned from 2040 but has stopped short of an immediate program to incentivize drivers to trade in their old model. Since the 2015 Volkswagen emissions cheating scandal, a number of major cities including Madrid, Paris and Athens have announced plans particularly focused on cutting diesel emissions including bans, fines and restrictions.